343 Industries, internally abbreviated as "343i", is located at 434 Kirkland Avenue. The numerical resonance is only a coincidence, but it gives the studio an aura of destiny even before visitors enter the structure. It is the only Microsoft building in the world to which a senior public relations staffer cannot get instant access by swiping an identification badge. The only thing that suggests what goes on behind the front door at is a reserved parking spot near the entrance labeled "Chief of the Week". What has been going on is development on Halo 4, the first game in the storied franchise to be created entirely by 343i. The building was custom built for Bungie Studios in 2004 when it was a subsidiary of Microsoft Studios. Josh Holmes, creative director on the Halo franchise, first visited the space when he was executive producing Halo: Reach and said it felt like the quintessential game development studio. Bungie moved out in 2010 after splitting from Microsoft and early the next year, 343i moved in. Kirkland is a quaint, middle-class suburb along Lake Washington, east of Seattle. On the streets near 343i are coffee shops and restaurants. The neighborhood, explains studio general manager Bonnie Ross, adds to the livability of the studio. As development on Halo 4 dragged on, she encouraged team members to take dinner breaks with their families. One staff member took on the role of "quality of life producer" and arranged family events like swimming at the local pool. One Saturday there was a bouncy castle at the studio so staff who needed to spend time at the office could bring their kids along. As with most videogame development companies, from the outside 343i doesn't look like much. It resembles a hanger or a barn. In fact, Ross said the building used to house a True Value hardware, a retail chain that for a time shared a "distinct, arched" architecture with Safeway grocery stores. The location's history is why 343i has such a substantial parking lot. There weren't many cars there one morning in late September, though. Kiki Wolfkill, Halo 4's executive producer, explained that her team was in the "final stretch" of development and many employees were putting in 14- to 16-hour days. Holmes wasn't even working at the studio. He'd set up a war room where a group of key developers was triaging bugs. "We look at what are the most pressing issues that we need to fix," he said. "It's a constant state of review." For Holmes that meant playing the game around the clock. "Every time someone changes something in the game there's an opportunity to break something," he explained. "The last thing you want is for something to change at the last moment that you didn't intend." The inside of 343i is a big, open space, with meeting rooms around the periphery and a sea of cubicles in the middle. An aisle running down the width of the building leads from the entrance to the cafeteria, which is simply a counter with a coffee machine and water cooler. The single foldout table that seats about a dozen people seems like a throwback to the True Value lunchroom of old. "We had a ton of candidates that basically said, 'I don't want to be the one who kills Halo.'" One wall is covered with mug shots of every employee. It's something Ross started to help her keep track of people new to the team as it grew, and she admitted to spending some mornings sipping coffee, staring at the photos. There are currently about 300 people at 343i across multiple teams, including publishing, franchise, and consumer products. About 70 percent of the employees are transplants from around the world: Canada, Europe, Japan, Mexico, South America, and others. In building out the team to create Halo 4, Ross and Wolfkill found that getting resumes wasn't difficult, but drawing out the unique talent required to make the game was more daunting. Because while Halo may be an exciting franchise to work on, building something new out of an existing intellectual property was a "unique creative challenge." According to Wolfkill, not everybody was cut out for it. Halo has its baggage. And its legend. "Who wants to step in the shoes of Bungie?" Ross wondered. "We had a ton of candidates that basically said, 'I don't want to be the one who kills Halo.'" Employees were amassed from across the entertainment industries. Collectively, they've won 29 Oscars and two Grammys working on projects as diverse as Avatar, Cars, and the Harry Potter and Star Wars films. "I think that the level of experience and talent that we were able to find was really high," said Wolfkill. "These people could have gone anywhere with their experience and they chose to do this." "Nobody came to 343 thinking that this was going to be a walk in the park," confessed Holmes. He and Wolfkill both credit Ross for establishing a foundation for the studio on a culture of collaboration. "You'd think in an environment like that you would have these raging egos," Holmes said. "And we don't have that." Ross had been managing game production for Microsoft Studios when she was offered the opportunity to take the helm of 343i in 2007. Ross set out a 10-year plan for the franchise. Part of that was to work on the fiction that anchors Halo. "The universe is our greatest character," she explained. 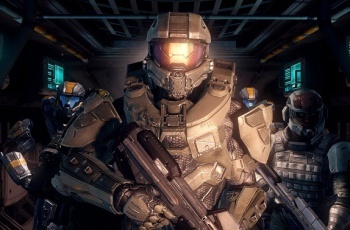 At the time, Bungie was working on Halo 3: ODST and Halo: Reach. "We didn't have the pressure of working on a game." Ross also decided to centralize production on the disparate Halo products under one roof. "Because the teams can work together," she explains. An example is when novelist Greg Bear visited the studio to talk about the trilogy of novels he'd been hired to write. "It was an amazing creative process," said Ross. "Having that back and forth, I think, made the whole experience better." According to her, it's a more productive process than sending an author off by themselves with some parameters for their story. The opportunity to focus on a Halo, a franchise that she had such a passion for, Ross said was a "once in a lifetime opportunity". The Halo universe, she said, is their greatest character, and 343i is being very deliberate about developing the "ecosystem". There are more stories to be told in other media, she said, and even other game styles. "You'll see that over the next several years," she added, "as we make some different decisions."